I’ve been reading that one of the hot new stars on the better beer circuit is … wait for it … lager! Sierra Nevada Brewing Co.’s Nooner, Firestone-Walker Brewing Co.’s Pivo, Left Hand Brewing Co.’s Polestar, and Lagunitas Brewing Co.’s Pils were all mentioned in stories all over the beer web in the past year as some of these “simple but beautiful” beers (to use only one example of the overworked lager clichés also all over the beer web last year). Why crown lager with this success in craft beer “culture,” on the craft beer “scene,” in the craft beer “niche”? Could it be lager’s smooth body, purity of flavor, or the way cold-aged lager tastes great at that natural maturation temperature? Maybe it’s the way lager is just good to drink and doesn’t crush your tastebuds with bitterness, or draw up your entire oral cavity with astringent burnt malt character, or pucker you up like a love-struck chimp with acidity and loosen your bowels with bacteria? (Don’t worry, I signed the loyalty pledge: “I, Lew Bryson, love IPAs, imperial stouts, sours and wild ales. They are the bestest.”) Could it be because we just needed another beer to crown as “the next IPA”? So lagers are the hot new thing, but this big well-known one that blew open the craft niche nationally over 20 years ago has a coolness problem. And don’t forget, lager is also the meat and potatoes of the hated megabrewers that strutting beer geeks still seem to feel a need to rail against. Why did it take lagers so long to get our attention, when they were right there in front of our faces all along? The truth is, lagers are old as dirt. Even pilsner, the powerfully successful baby of the lager family, is 173 years old. Back in the day, before you could find local “indie” beers everywhere, when we talked about good beer, we may have nodded to ales like Bass and Guinness, we may have humbly bowed to Belgian masterpieces like Duvel and Liefmans, but it was pretty much an article of faith that the very Beer Gods were German, with maybe a small antechamber in the pantheon for the Czechs. No other country built such huge temples to beer, invited the entire world to celebrate beer in an annual autumnal bacchanal, based such a large part of its economy on beer, and devoted millions to the science of beer, almost all of it—oceans of it—to lager beer! When small local brewers did pop up in America again, in the mid-Atlantic we got brewers that had lagers as a significant part of their output: Penn Brewery, Brooklyn Brewery, Stoudts Brewing Co., DeGroen’s, Victory Brewing Co., Tröegs Brewing Co., and, oh yeah, Samuel Adams. Same thing in the Midwest: Capital Brewery, New Glarus Brewing Co., Baderbräu, Schlafly, and the reborn Jacob Leinenkugel Brewing Co., Stevens Point Brewery and August Schell Brewing Co.. They even had some out on the Cool Brewers Coast: Sudwerk Brewery, Gordon Biersch, Thomas Kemper Brewing Co., Saxer Brewing Co., and Trumer Brauerei. Then there was this place called Yuengling that saw some reborn success. 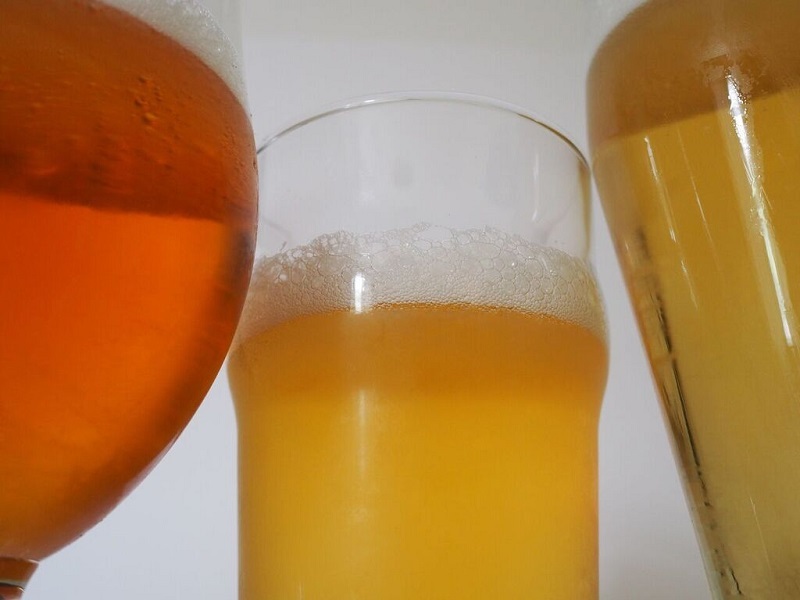 Maybe lagers didn’t get the sparkly attention of the geekiest because at their heart, lagers aren’t about the diversity and fecund experimentation so popular with the drinkers (one new beer at a time). They’re about deep, precise quality in fairly well-defined patterns. Maybe this: lagers are figure skating; ales are ice dancing. Or maybe this: a brewer I know said, “Ales! I could teach a chimp to brew ales. I make lager.” Unnecessarily confrontational (and I dare say a British brewer might disagree), but it’s a matter of deeply-held faith with lager brewers that their craft is more demanding and less forgiving than other types of brewing. Whatever the reason, this shouldn’t be about who was first. (We were, and you better not forget it.) This should be about expanding the horizons of beer enjoyment. If more people learn about how great pilsners and exports and bocks can be, we’re all richer for it. They’re not even one-trick ponies. Lagers can go from malt bomb to hop monster, they take to smoke exceedingly well, make for a great drinking session beer and can crush your head deftly with a glass-smooth alcohol power. I still agree with Bill Covaleski of Victory that lagers are the segment’s secret weapon to get to a much, much larger share of the total market; more people like lager than any other beer type. Lagers can be the way to huge growth. But what they aren’t, is anything new. Get over yourself. This round’s on you; go get another pitcher of dunkel, and I’ll teach you a drinking song when you get back. Don’t forget Jack’s Abby in Framingham, MA. Everything lager from amazing sours to brain-deadly barrel-aged “baltic porters” and then some. First time writer, long time lager fan here. Give me a well-made Helles or a Dort, and I’ll be happy as a bug in a rug. Appreciate your thoughts expressed in the article. While I like variety in the beers I taste, I tend to most like a simple, straight forward lager as a session type of beer. Lately ABC’s Mountain Lager is filling that niche, since I find it “maltier” than Boston Lager. What other more malty oriented lagers would you suggest I sample? Thanks for sharing your thoughts. There is a brewery out there that has actually made their lagers for over 120 years. They brew in German Copper, Krausen, open air fermented, and ACTUALLY USE LAGER TANKS. No one can remember their name anymore because they are old. Bud God bless the next guy new guy with all thy hype in the world that comes out with a soapy Pils Brewer in Chinese Ale fermenters with pellet hops and city wate. Budweiser …..The Great American Lager……Enough said.? I have no problem with a good lager, but definitely find them less imaginative. And, yes, sometimes that is exactly what one is after. Full disclosure: I work for Paulaner USA, the US importer of Munich’s Paulaner and Hacker-Pschorr. Though our most popular beers today are Hefe-Weizens (ales), our roots (all the way back to 1417 in the case of Hacker-Pschorr) are in lagers, so we loved reading this article. After generations of Americans associating all lagers with the light, adjunct-laden versions popularized by the big US brewers, it’s great to see American beer drinkers again recognizing the variety and depth of flavor you can find in lagers. Thanks, Lew, for calling attention to where the lager tradition comes from, and we certainly hope new lager drinkers in the US find their way back to us and other European brewers. But if their journey into realm of lagers begins with a “new” beer from their local brewery, that’s okay by us. Been in the brewing industry for three decades – and yes, lagers are the main part of what I do. I must say, I appreciate all styles that are made with care. Not a big IPA fan, but a well crafted one can interest my pallette. It’s a great time to experience beers in the USA! Sours, Saisons, Dunkelweisses, Lagers, Pilsners. Watch out, wine industry! Boston Lager is amber colored so it is really not what customers expect. Sam Adams should produce a golden lager which should eventually outsell Boston Lager (not a bad thing). Why a brewery as big as Sam Adams, doesn’t produce the #1 selling type of beer, is a mystery to me. I feel their reluctance to do this is because Boston Lager was the beer that made the company. Time to get past this if they want to get their volumes growing again.